As your business grows, the quality of your support should, too. How do you cope with the increasing customer demands and expectations? Rise up to the challenge with the help of the solutions discussed in this video. 00:39 – Why do you need professional support? As your business gets bigger… [Click To Tweet]. Get quality solutions. [Click To Tweet]. Set trigger points. [Click To Tweet]. Be free to deal with the VIPs: Your team and your best prospects. [Click To Tweet]. Today, I’m going to share a tip on how you can increase the quality of your customer service as you go from a small business to a big business. Here’s something that comes up a fair bit in coaching calls that I run at SilverCircle. It’s about offering a quality level of support. And a big mistake that people make is trying to do support via email. Email is not a very good solution as you get bigger because it doesn’t scale. In other words, you, the business owner, can’t really keep up with tickets. For example, in my business, we have 500 tickets open right now in our support desk. So my tip of course is get a professional support desk. There’s lots of quality solutions like ZenDesk or any of their competitors. And it gets you a fully hosted support desk away from your website. So now you have the ability to get support handled at the support desk. Now in the beginning, it might be you handling the support tickets. That’s OK. But eventually, you can hire people to run your support desk and you can build the team up as your support demand increases. In fact, what we do in our coaching is I set trigger points. When you get X number of tickets, or X number of jobs, then you need to trigger hiring of the next support person. We have about around 6 people who operate our support desk on a day-to-day basis. 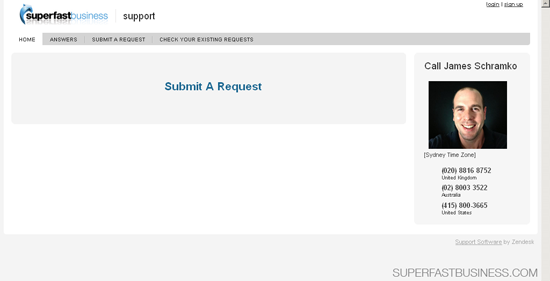 Later, you can add things such as LiveChat to increase the customer support that you offer your customers. And now emails aren’t getting lost to spam filters. You have an external support place away from your inbox. And this is one of the key secrets to keeping a lean inbox: running it with no emails – that’s getting rid of the noise out of your inbox. That frees you up to deal with the important people, that is your team and your best prospects. People who are buying a lot from you and people who are trying to buy from you. That frees you up to deal with them, while the support team takes care of all the other inquiries. So hope this tip has been helpful. I suggest that as a result of watching this, if you don’t already have one, go and investigate a professional level helpdesk like Zendesk. Have it installed on a domain that you own. Create an email that automatically starts a ticket if you just forward an email to that helpdesk, and then set about hiring someone to run the support desk to free you up to run your business. I’m James Schramko. I’ll catch up with you soon.